Today is the last call for entries for the Love Pollinator themed Mountain Fair Poster and T-Shirt Contest and applications for The Artist Fellowship Grant Program. Entries to Carbondale Arts must be in by 5pm at the Launchpad. Kindergarten and Pre-K enrollment at all Roaring Fork RE-1, Elementary Schools is today from 7:30am to 5pm. The Wheeler Opera House hosts the Aspen Shortsfest with a panel discussion at noon, and screenings at 2:30, 5:15 and 8. The Defiance String Band play at The Limelight Hotel at 4:30. Carbondale Chamber presents Spring into Wellness First Friday on Main Street and Carbondale Rec Center at 5. The Hotel Colorado host Spellebration a benefit for Literacy Outreach at 5. US Congressional candidate Karl Hanlon will be at Shlomo's Deli in Aspen at 5. 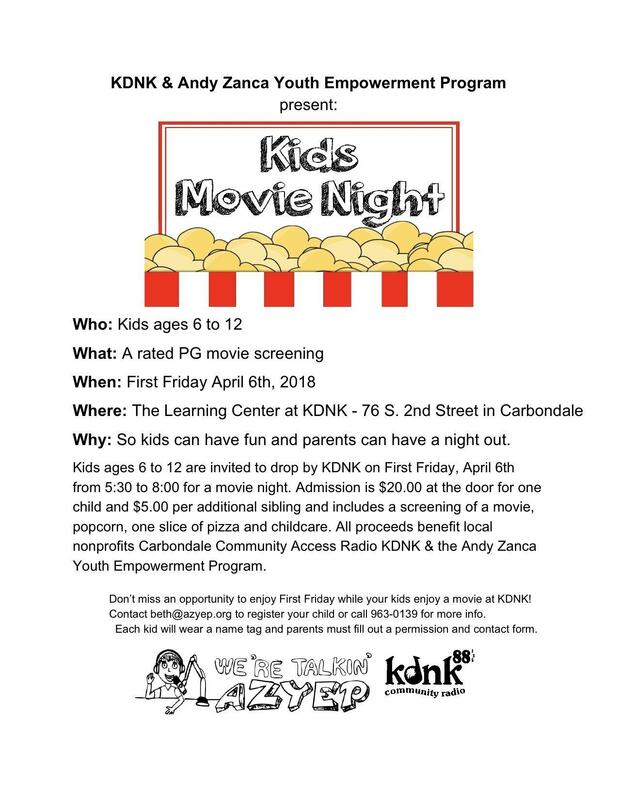 KDNK and the Andy Zanca Youth Empowerment Program host Kids Only Movie Night from 5:30 to 8:00. Parental permission form required. Info at A Z Y E P dot org or call 963-0139. Basalt Library offer Music at the Library with Jazz, Folk, Minimalism at 5:30. Carbondale Clay Center presents the opening of the Pro Tem Exhibit at 6. Lakota Tribe, Cherry Creek Singers will be outside the Launchpad at 6. Steve Barbee plays at Kanpai Sushi Glenwood at 6. Jeff Crosby plays at the Marble Distilling Company at 6:30. Sopris Theatre Company presents Cabaret at the New Space Theater Spring Valley at 7. Aspen Choral Society perform at Mountain View Church at 7. Pearl and Wood play a community concert at CMC Rifle Clough Auditorium at 7. The Crystal shows The Greatest Showman at 7:30. The Temporary presents the Taylor Scott Band at 8. Whiskey Stomp play at 8 at the Black Nugget. Sleepy Justice plays at Steve’s Guitars at 8:30. Painter’s Stage play at Glenwood Brew Garden at 8:30. Echo Monday play at Carbondale Beer Works at 9. And Belly Up presents Missio with Morgan Saint at 9:30. The Third Street Center hosts a celebration of the life of Amy Barr at 10 Saturday Morning. The Aspen Ute Foundation hosts a Native American Pow Wow exhibition of dancing and drumming at 3:30 tomorrow. And The Third Street Center hosts a fundraiser for Colton Farrell with music from Josh Rogan and Carin Mari at 6 tomorrow. You can submit your calendar items on our website or by emailing calendar@kdnk.org. Get out there and have some fun!